Friendship Bread is a heartwarming, extremely touching novel on loss, the healing power of friendship, and the tremendous gifts of sharing and forgiveness. The story centers around an Amish friendship bread that makes its way throughout the town of Avalon, Illinois. It changes the lives of five women in various stages of life, all dealing with different issues. You will feel their sorrows, revel in their successes, and love how they come together over tea and friendship bread. This novel is sweet and sentimental with a lovely ending. 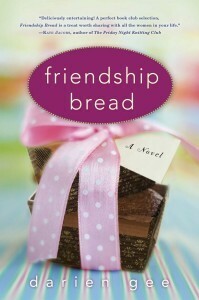 When you read it, you’ll want to share it with a friend, and don’t forget to add a starter packet of friendship bread!